Robert Parker is the most influential wine critic in the world, and his 1,500 page Wine Buyer’s Guide is now available in its 7th edition. 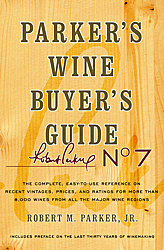 This wine book is an easy-to-use reference on recent vintages, prices, and Parker ratings for more than 8,000 wines from all the major wine regions. The first 40 pages offer interesting insights into how Robert Parker sees the world of wine, including his own role there. He thinks wine critics should be blessed with independence, courage, experience, individual accountability, emphasis on pleasure and value, focus on qualitative issues, and candor. After providing helpful advice on buying, storing, aging, and serving wine, he moves on to the “dark side of wine”, summarizing how some winemakers destroy the joy of wine by unnecessary fining and filtration. ratings and expected maturity for wines from recent vintages. While Robert Parker describes the style and specialties of each winemaker, the tasting notes of the individual wines are missing. Most of this wine book is dedicated to France, which doesn’t come as a surprise, given Parker’s love for Bordeaux and Rhone. Nevertheless, lesser known wine regions such as Hungary and Israel are covered, as well. In a nutshell, this wine book is not only a buying guide, but also an educational manual, making it a valuable resource for anyone with a serious interest in fine wine.